string(1329) "Resource Centre > Uncategorized > Employing Workers’ Sense of Value as a Key Performance Indicator (KPI) to Drive Facility Improvement in Social Responsibility"
While many brands have gathered worker feedback to increase engagement, when closely examined, the efforts have tended to be brand-centric with workers’ interests often overlooked or marginalized in favor of supply chain risk management. 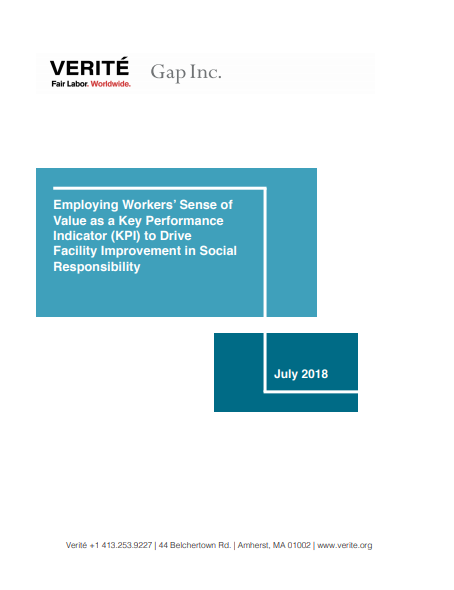 The findings reported in this white paper from Gap Inc. and Verité demonstrate that taking a worker-centric approach to sustainable supplier performance improvement can be mutually beneficial to both workers and management. In 2015, Gap Inc. launched a Workforce Engagement Program to measure the degree to which garment workers feel valued and engaged at work, and the factors that affect these feelings. The program sought to set priorities and goals for facility improvement. Another goal was to develop connections between various Corporate Social Responsibility (CSR) programs to effectively respond to the feedback of workers. Gap Inc. partnered with Verité to develop and implement this program. From 2015 to 2016, Verité assessors gathered information from workers and management through written surveys, focused group discussions (FGDs), and individual interviews to derive insights on issues of concerns that matter most to workers. The initial Verité survey assessments were conducted in five countries (China, Bangladesh, India, Guatemala, and Vietnam) covering 78 facilities with a total worker population of 187,036. Based on Verité’s findings, Gap Inc. partnered with its suppliers to make investments in response to worker feedback. The assessment also informed the training programs for facility managers, who can have a direct and profound impact on workers’ sense of value (SOV), engagement, knowledge, and overall well-being. In 2017, Verité conducted 34 reassessments to measure improvements. The study indicates that the improvements in management practices, especially in the areas of Immediate Supervisors, Training and Development, Fair Treatment, and Communication and Feedback had significant impact, with positive changes in these areas driving score improvements in workers’ SOV and engagement. Workers’ SOV scores increased by an average of 14.01% in 24 out of the 34 facilities reassessed. Workers’ sense of engagement scores increased by an average of 11.62% in 25 out of the 34 facilities reassessed. Workers’ rating of management practices improved by an average of 11.49% in 25 out of the 34 facilities reassessed. In short, this study found that this type of assessment can maximize workers’ participation in setting facility improvement goals that matter most to workers, as well as measure the impact of programs on workers. Most important, this project points to the significant potential for sector-wide, sustainable change that is possible if the practices outlined here are adopted widely by brands and suppliers alike. The entire apparel sector will gain much from articulating and measuring impact in terms of concrete, verifiable gains made in workers’ SOV and engagement as the core building blocks of mutually beneficial worker/management cooperation.